Okay, I say "old manicure" tongue in cheek as my polish was only a day old. But I couldn't resist putting a silver lining on my nails. I used a favorite of mine - OPI "Make a Comet-ment" and tape for my design. First I set up my workstation and tore enough tape to do each nail. Now on to the fun stuff. Again, always put the tape on the back of your hand to get most of the sticky off before you put it on your nail. Brush the accent polish on the open area of nail and remove the tape quickly. Voila! I did a quick manicure tonight and I am loving the results. Two coats of Fingerpaints "Are You Blue" and one coat of OPI "Iceberg Lotus". What a phenomenal combination! The Fingerpaints had a flawless application and the dry time was super fast! Forgive the shadow but this was the photo that showed the color the best. Also, I was a bit messy on the application as I was rushed packing for a trip. Then I added one layer of OPI "Iceberg Lotus". I love this glittery polish. It is a wonderful, majestic blue-green color. I wish the photos would pick up the green iridescent color. But until the weather is better again in Wyoming I am not going outside to take photos. The wind is blowing hard enought to blow the polish right off my nails! Again, a wonderful application and the brush was amazing! Basically one or two swipes and you are done! I got a little over-zealous so now I need to spend some time cleaning up. A couple of months ago my sister introduced me to Venique. She is getting her cosmetology license so she has access to things I don't. I ordered this one from Ebay. But I am going to have to get her to be my supplier. I tried the Venique B-Ceen-B-Gorgeous. And that it is... Gorgeous that is. It has a flawless application. This picture shows two layers of the beautiful lacquer. It's time to place another order! They are a relatively new company so their color line isn't that extensive yet. But I can't wait to see what they come up with next! Good morning everyone. I have a special giveaway for you. Not one, but two people will win the Color Club Back To Boho Collection! Since I am going to Cancun I thought I would do something special for you too. This giveaway is limited to the US. Must follow on Google Friend Connect (GFC) I know the entry form says follow on Google Friend connect but due to the reasons above just Make a blog comment and then click "Do It" where the entry says "Follow on GFC." I don't want to change the entry for fear it will take away previous entries. Make sure you have your email address visible on your GFC. If not, or if you aren't sure feel free to leave a comment below with your email. The giveaway will end at 12:01 a.m. on February 6, 2012. The winner will be emailed and will have 48 hours to respond. If no response is received in that time period another winner will be chosen. Great Combo! I am loving it. I was practicing stamping tonight and let's just say I need a lot more practice. So I started doing some swatches to share with you. I thought I would do several so I would be able to post something even when I didn't have time to do anything amazing. But when I created this combination I just had to share it as soon as possible. OMG! I started off with two coats of Color Club "Artsy Crafty" which is a wonderful hunter green color. I found it in the "Back to Boho" Collection at Ross. It was one of 6 colors in the collection and I got the whole collection for $5.49! It applied beautifully and I actually love the color all by itself. Then I added one layer of Fingerpaints "Comet's Collar" which I also got on clearance at Sally's Beauty Supply for $2.99. Of course I finished it off with Seche Vite Fast Dry Top Coat. People either love SV or hate it. Personally I positively love it! I can do my nails and go to bed and not worry about having "blanket lines" in my nails when I wake up. What is your perfect combo? So I decided to do some swatches. I put on Sinful Colors "Soul Mate" and I like it. It is a gorgeous coral color. 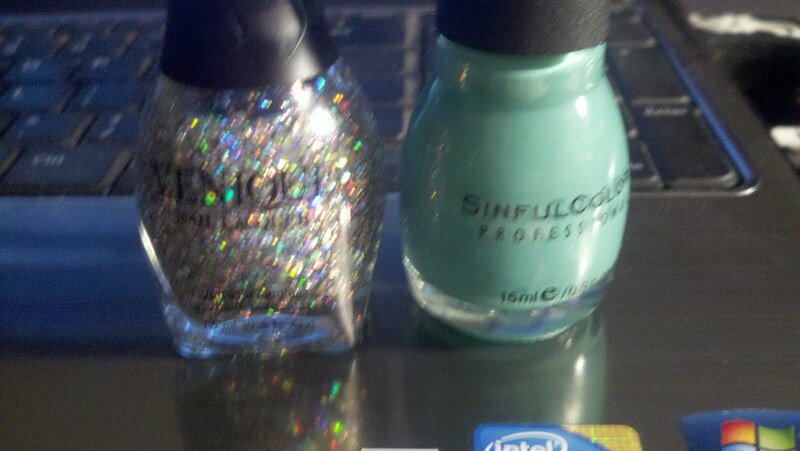 My favorite Sinful Colors and maybe one of my all-time favorites is "Mint Apple". It is the color shown in my banner. But Soul Mate is a nice color too. Sinful Colors goes on great. It does seem to get a few lines when you first apply it, but they disappear quickly. I wish I had better lighting. But even when it's daylight here the sun is illusive in the Winter. It is Wyoming after all. This is my first attempt at freehand nail art. I thought about using tape to make perfect lines -- But then I realized I wanted the lines to be "off and wavy" so they would look more like a beach scene. I used a toothpick for drawing the trees. I'm not sure why the photo is sideways. It isn't really that way when I view it. But you get the picture. Zoya "Charla" makes the perfect color for water! I recently read a review of Claire's Magnetic Polish by Cosmetic Sanctuary and I just had to run to Claire's and get some for my very own. I used the rose colored polish and was positively enthralled with the results! Just like in a couple of the reviews I read the polish brush was a little wonky. But it worked fine with a little extra care. If for some reason you lift the magnet a little to early do not put it back down. It just smudges all the gorgeous lines created by the magnet into a big blob. If you want the look of the magnet polishes without a huge cost this is the brand to get. It was about $8.50 and it had a special of get one and get one at half price. Hello everyone, I said I would be doing a post on Scotch tape manicures so here you go. I love glitter and I love bold colors. If someone had told me a year ago that I would know the names of these polishes I would have told them they had lost their mind. I wanted to experiment with a Valentine's Day Manicure, although this combination may be a little more Christmasy. I started off with a base coat from Sally Hansen. I change my colors enough that a base coat isn't really needed but I hate to stain my nails with the bright colors. Then I applied two layers of Sinful Colors "Sugar Sugar". I love the color. Sinful Colors has a nice thin brush and applies well. But sometimes it does give me a few bubbles. But just make sure the coats are nice and thin and it eliminates that problem for the most part. Then I used a coat of Seche Vite Fast Dry Top Coat. I love that stuff! It dries so fast means I can tape off my fingers relatively quickly without damaging the base layer. Tear off enough Scotch Tape strips to do the pattern you want and stick them around your worktable. This will help you avoid smearing the polish when you move from finger to finger. Take the Scotch Tape and apply it to the palm of your hand or the back of your hand. You just want to get a lot of the sticky adhesive off so it doesn't stick too much. Then apply the Scotch Tape leaving the area you want to accent. It doesn't have to be a stripe. It can be a straight tip, or a diagonal one -- or anything your heart desires. Use your imagination. Trust me - this is the hardest part. Trying to get the angles the same and the accent the same width is trying at times. Obviously I should have tried a little harder. Then apply your accent color over the open area of tape. For my accent color I used Nicole by OPI "Make a Comet-ment"
Take the tape off quickly so the polish doesn't start to dry and pull off with the tape. Do the same on each finger and Voila! You get an amazing accent without having to freehand anything. Goodness knows if I tried to freehand it would look like a kindergartner did it. Scotch tape has become my friend lately. I really like using it to change my manicures up. 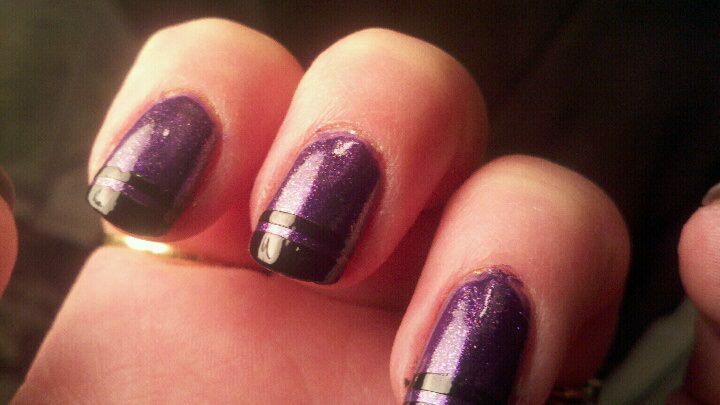 For this one I used Zoya Mimi with Ultra Pro Black on the tips. I know the photo isn't the best because I took it with my Droid. I promise to use my good camera as much as possible in the future. I really like the color combo on this. Of course Zoya is one of my all-time favorites. Such a great application and it wears wonderfully. I am going to do this manicure again this week and I will take photos as I go so those of you who don't know how tape manicures work can see it step by step. Stay tuned! 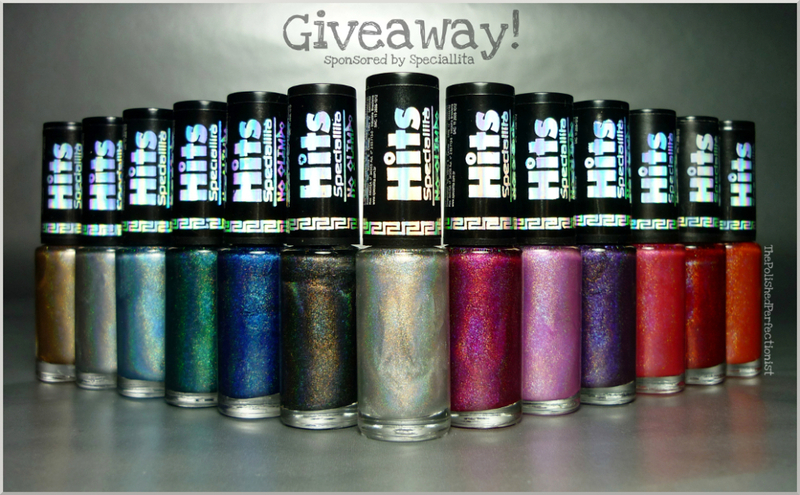 The Polished Perfectionist is having an amazing giveaway. I would love to get my manicured little mittens on this Hits No Olimpo collection! Twelve beautiful prismatic shades and a prismatic top coat. Just think of how many times we could change polish colors if we had this sparkling, glittery set. This has been on my wish list and I am sure once you see it you will add it to your list too. So check out her blog and enter! I am hosting my first giveaway! Up for grabs is a bottle of Finger Paints "Asylum", Wet n Wild Coloricon gold glitter polish, Sally Hansen Diamond Strength "Honeymoon Red" and a Nyx Luscious Lip Gloss pallet. The Finger Paints is a wonderful fleck polish that goes on smooth and has a phenomenal iridescent effect. Sally Hansen Honeymoon Red is a pure shade of red to complement most any skin tone and the Wet n Wild Coloricon, well... Do I need to say more? 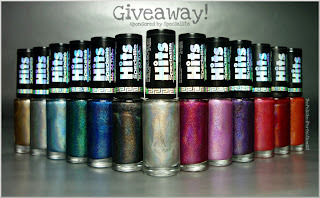 I am hoping this giveaway will jump start my blog and I can share my obsession with other "junkies." I have to limit this to US because of shipping restrictions. The giveaway will end at 12:01 a.m. on January 29, 2012. I am new to all of this and I will be posting swatches, successes and I am sure many failures as well. I hope you will take this journey with me and share your tips and tricks with me and the readers. The first thing I have learned is to use my digital camera instead of my cell phone camera. So you can expect better photos in the next post. Today I went to a friends house to do our nails. (By the way she is now one of us. I corrupted her.) I put on a base color of gray and a accent stripe of Zoya Charla on. It was a complete failure. The colors just didn't pop. So then I got home and started over. 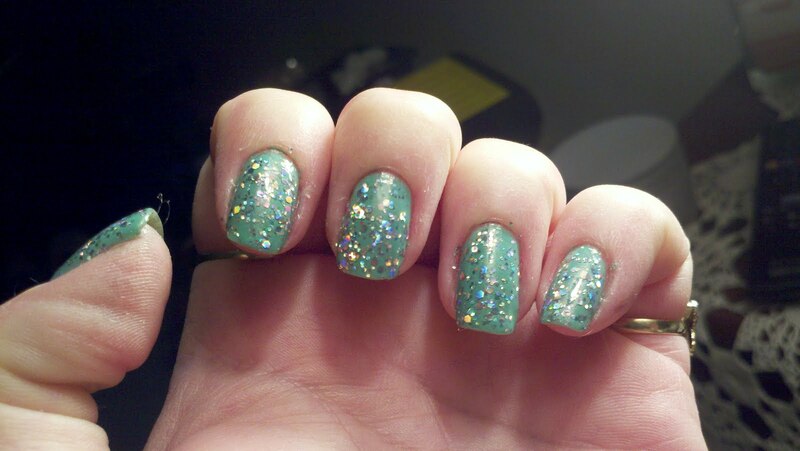 I used Sinful Colors - Mint Apple with Venique Twinkling glitter on as a top coat. Now I wasn't completely impressed with the application of the Sinful Colors. It seemed to have a long drying time and the second coat seemed to remove the first coat. But I made it work. Then I put on 2 coats of the Twinkling Glitter. OMG! Super easy application and fast drying time. Best of all the Glitter is completely holographic. I am posting a photo that was taken in artificial light. It just doesn't do it justice. Here is a video that really shows how holographic the Venique really is. I am truly impressed. 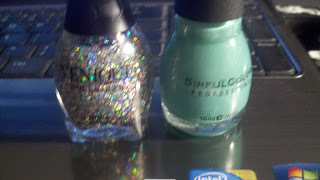 The video is a little out of focus but it does so the shimmer, shine and shifting colors.